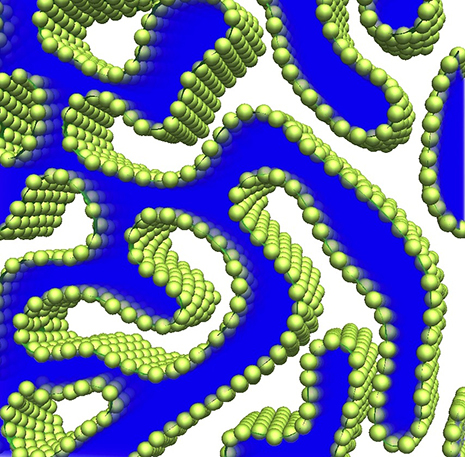 Computer simulation of a polymer blend with nanoparticles at the interface. FAYETTEVILLE, Ark. 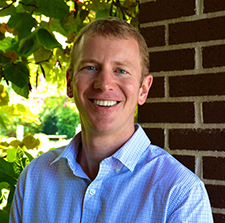 — The University of Arkansas has received a $411,948 grant from the National Science Foundation to study the creation of useful materials and membranes from blends of multiple polymers and dispersed, inorganic nanoparticles. The research could lead to the development of new materials for a variety of applications, including filtration membranes, fuel cells, batteries and biomedical scaffolds for tissue engineering. Paul Millett, assistant professor of mechanical engineering and principal investigator for the project, is working with Miko Cakmak, professor of polymer engineering at the University of Akron. Their goal is to investigate how the polymers and nanoparticles interact with each other and assemble into arrangements with long-range order and functionality. The researchers will make porous membranes with internal pore surfaces covered with densely packed, partially exposed nanoparticles, Millett said. Paul Millett, University of Arkansas. Research has shown that nanoparticles made of silicon can split water molecules to create hydrogen fuel. There are other nanoparticles that convert carbon dioxide into other gases that might have potential applications for mitigating climate change. However, Millett and Cakmak are mostly interested in the processes that take place during the creation of these porous membranes. The researchers will blend together two types of polymers that prefer to separate into two internal phases, similar to oil in water, and add nanoparticles to the blend. The nanoparticles will be designed to segregate to the interfaces between the two phases, a process that prevents the polymer phases from coarsening beyond microscopic scales. The researchers can tune the final arrangements by changing the composition or by applying external fields, such as an electric field. Millett’s work focuses mainly on computer modeling and simulation of the microscopic assembly processes, while Cakmak will be working on making these materials in a laboratory and studying their properties.